The Oil Nut Bay Residence looks at the traditional prototypical home: the courtyard house. Using this typology allowed us to study the programmatic and climatic benefits utilized for centuries. 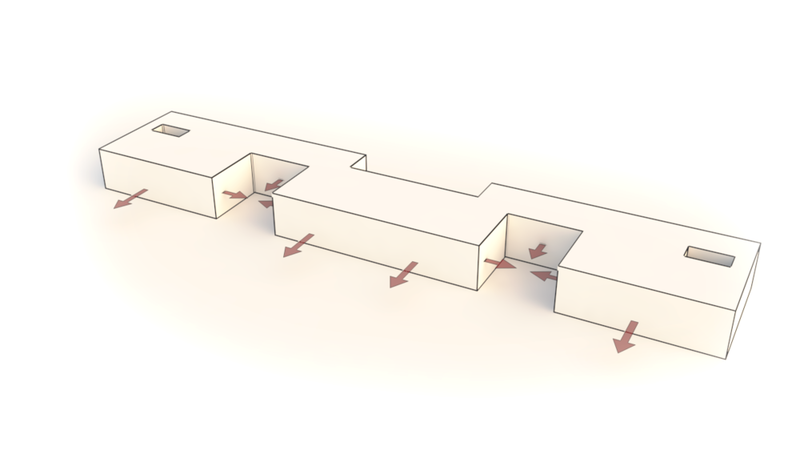 Beginning there, the courtyard volume is sliced and expanded to a bar in order to work with the steep topography and existing conditions of the site. Courtyards and subtractions then begin to carve away at this bar, bringing light and greenery into the interior of the spaces, while breaking up the interior program and elongating the house. The effect of this elongation is that rather than a large building which stands in contrast to the topography, the Oil Nut Bay Residence is a linear building, which parallels the contours of the topography. This allows the panoramic and plunging views to the sea to be the focus of each space throughout the home. In order to mitigate some of the impact of the steep site, and in order place the home well below the road above without an excessively steep driveway, the entrance to the home is on the roof. Upon arriving to the home, visitors are confronted with a screen wall covered in vines – almost like a hedge – which shields the view out to the sea. Entering through a large door in this wall, visitors are immediately confronted with panoramic views of the sea and Necker Island while standing in a foyer at the roof level. One then descends down a large entrance staircase to the main levels of the house into a large outdoor sitting area which divides the more public spaces from the more private living spaces of the residence. Living and dining flow into one space, while the use of fully glazed walls, allows a seamless transition from indoor to outdoor, effectively doubling the size of the home. A single master suite on the upper level provides seclusion with a private Zen garden and hot tub secluded on the back of the house. Two guest rooms and a junior master are accessed via a grand floating stair case and connect to a wood clad yoga deck on the lower level. A landscaped path leads from the house to a small private beach – a unique feature of this site – and a small beach hut, while the lower levels of the home devolve into terraces and begin to integrate the house into the surrounding natural landscape. The end result of these moves is a structure which blends in to its surroundings, revealing only the main levels of the house to the outside, and an interior in which each space takes advantage of the views.